Love yourself some eco-friendly jewellery? Try these unique decor items and other pretty things at Aranya Earthcarft. Their stuff is mostly inspired by nature, and the collection includes a lot of biodegradable products. The name Aranya means green forest, so everything that they design or produce is inspired by nature. Their aim is to promote eco-friendly art, creatively using biodegradable materials in whatever they make. 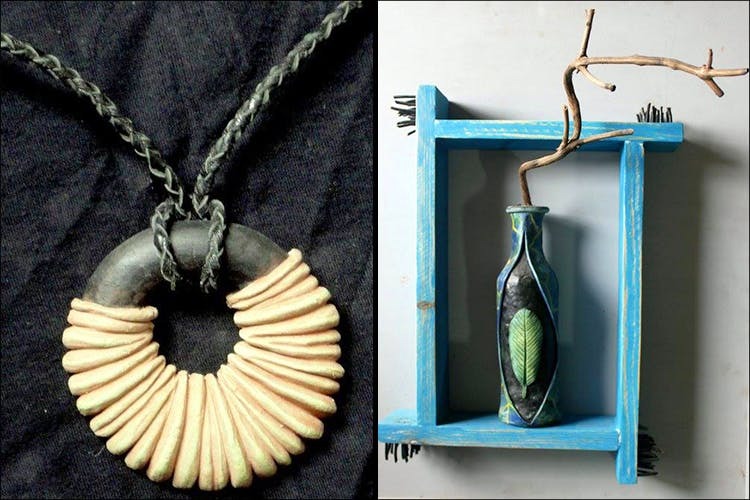 Preeti Gupta and Dr. Vivek Prasad have spent almost eight years in the field of arts and crafts, having perfected the use of simple materials to make funky jewellery and home décor products. What Should You Spend Your Greens On? Everything we saw was either made of paper mache, clay, paper, pulp or edible resin, including the stunning earrings. You can wear them to work and make that environment-friendly statement you’ve always been wanting to. Apart from that, check out their quirky lamps and other offbeat home décor items. If you want to do your bit for the environment and don’t know how, you can always start by supporting sustainable arts and crafts ventures.